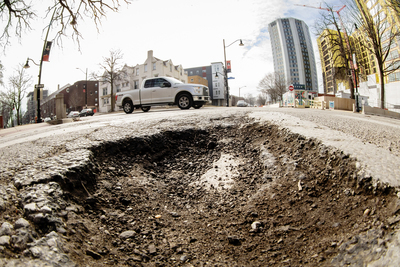 Potholes, like this one on the campus of University of Illinois at Urbana-Champaign, are a common obstacle this winter. 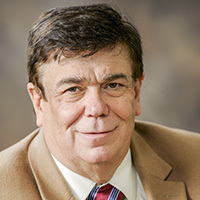 Industrial and enterprise systems engineering professor Henrique M. Reis is an expert on asphalt concrete. Many people understand that extreme cold contributes to pothole formation, but can you explain this in more detail? Most roadway pavements are made of a mix of materials. The most common type of road pavement is called asphalt concrete, which is made of a sticky black binder and crushed stone. The sticky binder reacts very differently to cold temperatures than crushed stone. So, when the temperature changes, the stone and binder expand and contract at different rates, causing physical stress buildup. When that stress exceeds the strength of the asphalt binder, cracks will develop and eventually form potholes. There are different grades of binders designed for different climates. For example, one common type – called PG 64-22, which is used in Illinois – is specifically designed for an environment where the average seven-day pavement temperature is expected to be between 64 and -22 degrees Celsius. However, this type of performance designation only applies to fresh, new binder. As binders age their performance diminishes, and the temperature at which they will fail becomes warmer. As a result, older pavements develop cracks at warmer temperatures during the winter months. Are there any advantages to other types of pavements? Portland concrete roads, which look more like the concrete you see in buildings, also fail from freeze-thaw cycles and from other failure modes such as cracks induced from poor underlying material layers. Asphalt concrete roads have many advantages over other types of pavement, including being more flexible, less noisy and perhaps less costly to repair. How are potholes repaired today? Typically, crews fix potholes by dropping a loose mixture of binder and stone into the pothole followed by compaction. Prolonged exposure to the environment causes chemical changes to occur in the asphalt. Over time, it will harden, causing the material to become brittle and break down. However, similar to the way people apply cream to their skin to turn back time, pavements can be sprayed with something called rejuvenators to restore the top material layer to its original crack-resistant state. Rejuvenators address the issue of pavement hardening by softening the aged asphalt back to its original condition and restoring its chemical makeup. In a 2015 paper, my research group presented evidence that rejuvenator application may turn back the clock by restoring the physical and chemical properties of the original asphalt. To reach Henrique M. Reis, call 217-333-1228; h-reis@illinois.edu.